While the Quick Tour will ensure that your students understand how to navigate ScootPad, the new dashboard improvements will be sure to keep them fully engaged on their progress. Big and bold task labels– Out with guessing! Your targeted practice, assessments, and adaptive practice have clear labels helping both you and your students easily identify the task. 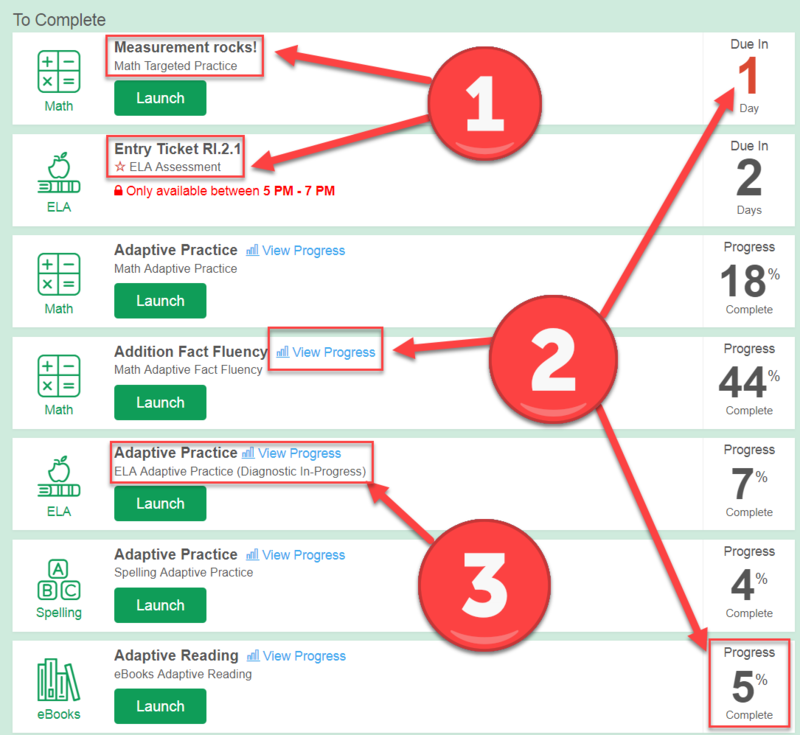 Student progress-How much of the Learning Path (LP) completed, due dates and a view progress button (LP data) ensure students can always see how they are pacing towards mastery and completion. Diagnostic In-Progress-The diagnostic acts like a “head start” within the Learning Path. This head start allows students to progress through the Learning Path at a faster pace and start exactly where they need to. If Adaptive Practice shows “Diagnostic In-Progress”, the student can click on “view progress” to see how many concepts they’ve passed! Ever wonder which ScootPad features you already use and what else ScootPad has to offer? The new ScootPad Usage indicator on the teacher’s dashboard shows exactly this information. If you are at a 100%, this means you’ve used all ScootPad features and this indicator won’t be shown 🙂 The usage indicator gives you an overall % and allows you to quickly drill down and see which features you may want to Get Started and learn more! Classrooms– Inactive students (haven’t signed in within 365 days) will be UN-ENROLLED from the classroom. Teachers will be notified and have 1 week to take action before this happens. Teachers– Inactive classrooms with 0 students (haven’t been launched within 365 days) will be PERMANENTLY DELETED. Teachers will be notified and have 1 week to take action before this happens. Parents– Inactive students not enrolled in any classrooms will be PERMANENTLY DELETED after 365 days of inactivity (haven’t signed in). Parents will be notified and have 1 week to take action before this happens. School– Students not enrolled in any classrooms AND considered inactive (haven’t signed in within 365 days) will be PERMANENTLY DELETED. Admins will be notified and have 1 week to take action before this happens. Want to learn about other Improvements? Check out the Top 10 Improvements for 18/19 by registering for a webinar this summer [Click Here] . There is always more to learn so don’t hesitate to explore or reach out to our support team by clicking the orange Help button.